Karen Mahaffy in her immersive installation at the Southwest School of Art. Though trained as a sculptor, San Antonio artist Karen Mahaffy has worked primarily with video for the past fifteen years. 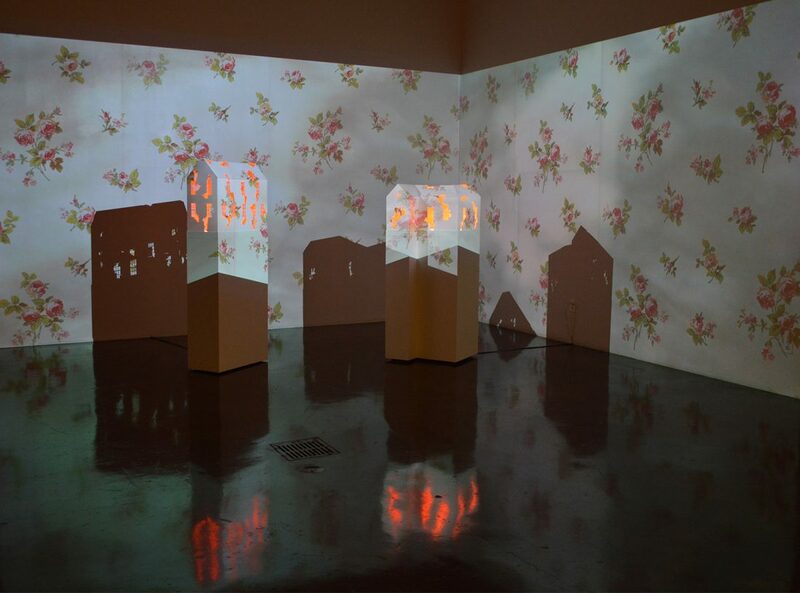 In her current installation on view at the Southwest School of Art through July 3, Mahaffy has expanded her video explorations to include an immersive environment in which viewers are sheathed in the light of a projection. At the same time, she’s returned to her roots by integrating new sculptural works into the same video-illuminated space. Originally from the Midwest, Mahaffy received her BA in studio art from Hope College in Holland, Michigan in 1992, and then moved to San Antonio to study at the University of Texas, where she earned her MFA in 1996. Her first solo exhibitions occurred around 2000, when she was making feminist sculpture. This included an installation of mattresses she upholstered in red silk and a clothing rack with female undergarments adorned with stitched-on text describing women, all handmade by the artist. When Mahaffy turned to video in the early 2000s, she chose her process of making things associated with female roles as her first subject. Mend, 2001, double channel digital video projection, 45 min. In Mahaffy’s dual-screen video Mend (2001), which was presented in a continuous loop, viewers saw close-ups of the artist’s hands simultaneously removing the buttons from a man’s shirt (in the left section) and sewing them on again (at the right). With the sound amplified enough to turn the repetitive movements of the mundane activity into audible markings of time, viewers could consider whether a stereotypical female task is a tedious labor or a therapeutic meditation. In the subsequent video Untitled (Cintas) (2005), Mahaffy shifted her focus from an individual at work to the collective zeitgeist of women earning wages factory-style at a uniform laundry service. Presented like the earlier work in a diptych format, the video compared and contrasted the noisy environment of the female laborers with the relative quietude of the building’s exterior, where there is an occasional interruption of trucks driven by men. This video is relevant today in its questions about income inequality. Still Life with Fruit and Zhuang Zi, 2005, digital video, 22 min. 14 sec. Soap with Votive, 2006-07, digital video, 4 min., 32 sec. In 2003, Mahaffy received a Fulbright-Hays grant to travel to China. As she immersed herself in Chinese culture, she became familiar with the writings of the Taoist philosopher Zhauang Zi, whose parable The Butterfly Dream questions whether a waking state is any more real than a dream state. Around that time, she also read an essay by the French philosopher Roland Barthes, in which the author discusses the nature of objects in Dutch memento mori paintings. Influenced by both of these texts, Mahaffy produced two time-lapse videos of still life compositions that mimic memento mori paintings of the Dutch Masters. With their slowed-down movements of ice dissolving in a glass of water, bubbles settling on a bar of soap, and the flame of a votive candle gradually extinguishing, these videos heighten awareness of the passage of time and the transformation of an object from one state to another, while also reminding us—in the tradition of the Dutch still life paintings—that the existence of all things is temporal. Hotel (Shanghai), 2004-08, digital video, 9 min. 18 sec. Untitled (Persistence of Moment) No. 2, 2010, digital video, 5 min. 13 sec. In China, Mahaffy began making videos specifically aimed at recording the passage of time in a way that reveals the beauty and emotional qualities that can be found in what she considers to be “small, unnoticed, passed over moments.” To create Hotel (Shanghai) (2004-08), she positioned her camera in one spot and focused it on the window so that the reflection of the room’s interior, the cityscape seen through the window, and the subtly shifting curtains that frame all this blend together to form a gently lyrical composition of darkness punctuated by flickering lights. And in 2009, while visiting Estonia on a Fulbright Scholar’s grant to study the influence of place on contemporary art, she created a related work, Untitled (Persistence of Moment) No. 2 (2010), in which a bare white wall is transformed over time by the gradual materialization of a window reflection made visible by sunlight. Untitled (In Praise of Shadow No. 1), 2007, digital video, 6 min. 18 sec. Untitled (Lamp), 2009, digital video, 1 min. 26 sec. In addition to shooting straight video, Mahaffy has devoted considerable effort over the past decade to constructing video collages. Using digital editing programs, she creates artificial realities that seem plausible. Those who view only snippets of the black-and-white video Untitled (In Praise of Shadow No. 1) are likely to believe that they’re watching shifting shadows of furniture, a light fixture, and the outdoors reflected on decorative wallpaper. But those who sit through the entire video will witness incongruities that occur at various moments, as when the wallpaper decoration morphs from all-over patterning to a design made up of vertical registers, or when the shadow of a table and lamp is replaced by the dark silhouette of a chair. Inspired by Jun’ichirō Tanizaki’s essay on the subtleties of shadows in relation to the Japanese aesthetic principal of finding beauty in transience and imperfections, the imagery is entirely constructed on a computer, with everything originating as digital drawings. Mahaffy employed a similar approach in 2009 when making Untitled (Lamp), where we see an inexpensive imitation of a vintage lamp transition from dimness to exaggerated brightness, accompanied by a humming sound that escalates as the light grows. Composed entirely by digitally manipulating still images of a lighting fixture in an Estonian hotel room, the light amplification is pure artifice, as is the sound that Mahaffy created using her own voice. Untitled (City Sleep), 2015, digital video, 4 min. 58 sec. One of Mahaffy’s most enthralling videos is a work she created during her recent residency at Berlin’s Künstlerhaus Bethanien, a program sponsored by Blue Star Contemporary Art Museum. With its subtle blending of night sky images shot from Mahaffy’s Berlin studio window, rapidly paced light reflections videotaped from a moving train, and digitally drawn silhouettes of buildings, City Sleep (2015) beautifully evokes the suspenseful mood of a 1940s Hitchcock movie. In her post-residency installation at Blue Star and her current one at the Southwest School of Art, Mahaffy projects video images of fictional wallpaper that fill entire spaces, spanning across room corners. In Untitled (Pattern Shift No. 4) (2015), patterned wallpaper that Mahaffy photographed at a former Nazi prison has been animated so that its flowers move about, blur, and become stained by pink blobs that drip like blood. The flowers could be metaphors for the Jews who were killed in the Holocaust, while the stains suggest the historical tarnishing of Germany. With Untitled (a gain/a loss/a gain) (2016), Mahaffy shines the video spotlight on her personal memories, filling the illuminated space with two house sculptures, one of a doll house that she owned as a child, the other of the 1912 home where she currently lives. Enveloped and surrounded by an animation of floral patterns from scanned vintage wallpaper, the houses are lit from within and their exteriors are broken up with pixellated openings. As each flower in the wallpaper dissipates and disappears, new ones take their place, while the internal lighting of the sculptures becomes alternately brighter and dimmer. As viewers stand within the luminous space where lights and images morph and change in continual movement, they experience a sensory shifting that blurs the boundaries between the present and the past, as well as the real and the virtual.